I bought some of this fencing several years ago, and was glad to find it is still available. I believe I purchased it from frontgate.com in packages of four. They no longer carry it but I found it at the link at the bottom of this post. From the site description: "The beautiful design features an intricate vine and leaf pattern, looping and arcing through itself. An eyelet opening on one side of the border allows it to interlock with another piece, helping to secure the units in the ground. Use a single one of these 24.5 long sections as an accent piece, or link multiple units together to form an elegant border to your yard or garden. String these panels together in straight lines, or align them in right angles to create corners. 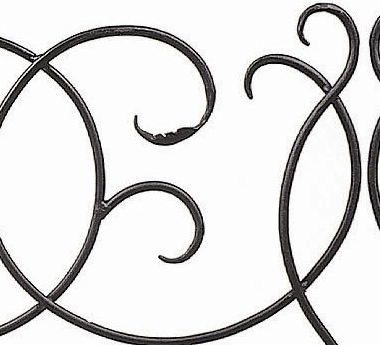 The forged iron construction is sealed in a black powder coat for resilience and durability. 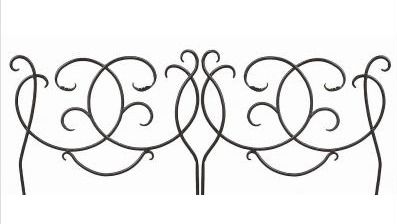 Add a touch of esteemed beauty to your yard with Scroll Fence Sections." The ones I purchased were constructed very well. They've weathered at least 7 winters outside and still look every bit as good as when they were first purchased. Each section is $26.75, before shipping. They state shipping cost as $9.95, but I assume that is to US addresses. I am going to make my granddaughter using this pattern & some seriously wild fabric.